Just 15 minutes to get this tasty main on the table! Meanwhile, melt butter in a skillet over low heat and cook, swirling pan frequently for about 5 minutes until golden brown in color. Stir in parsley, salt, pepper, and peas. Cook an additional 2 to 3 minutes until peas are completely warmed. 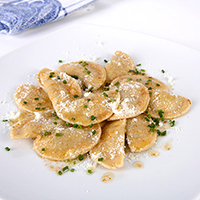 Toss the ravioli with the brown butter sauce and top with freshly grated Parmesan cheese.